Welcome to my collection of favorite things! I hope you’ll find something you love here! Everything is linked to Amazon.com so you can easily learn more and purchase these items if you wish! The Food Lab by Kenji Lopez Alt. If you are a food nerd like me, you will LOVE this book. The author has done tons of experiments in the kitchen to solve your most vexing problems (like how to get truly crispy fried chicken and home made French fries). His experiments shine new light on commonly held beliefs. Have you always been taught you should sear your meat to seal in the juices? It’s not true! (I knew it!) But searing your meat does serve another important function, and it’s all explained in this book! This book is a must for any serious chef or home cook who wants to know the “why” behind every cooking technique. Our Best Bites: Mormon Moms in the Kitchen by Sara Wells and Kate Jones. One of my most-loved cookbooks. I’ve made tons of things from this book. Some of my favorite recipes in it are Brazilian Lemonade, Chipoltle Chocolate Chili (here’s my take), Guiltless Alfredo Sauce, Roasted Garlic Rosemary Potatoes (here’s my take), Pumpkin Pie Milkshake, and Cream Puffs (here’s my take). As you can see, I’ve adapted and posted many of the recipes from this book on my site! Here’s a link to a cheaper paperback version if you don’t want the hardbound spiral version. Savoring the Seasons with Our Best Bites by Sara Wells and Kate Jones. This follow-up book to Our Best Bites has more great recipes that my family loves. From Banana Slush Punch (the best punch in the world–here’s my take) to Easy Thai Coconut Soup, Strawberry-Lemon Butter Cookies (here is my version with raspberries), Naan, Crispy Shoestring Onions (I made onion rings with this recipe), to Chunky Monkey Pancakes, this book has a huge variety of recipes that are fun to make. Both Our Best Bites cookbooks also have fun crafts and cooking ideas for kids. Sally’s Cookie Addiction by Sally McKenney. Hands down, my favorite cookie cookbook (and I’ve got a lot). So many amazing, fun recipes in here. I’ve got a bunch of them on my list of “must make” recipes. For example, Lemon Creme Sandwiches, Double Chocolate Coconut Macaroons, Coconut Lime Shortbread, Chocolate Peppermint Biscotti, Monster Cookies, and more! Here are some that have already made it onto the blog (with my own special flair)! Pumpkin Spice Sugar Cookies, Butterscotch No-Bakes (Cashew Cornflake Clusters), Mint Chocolate Slice-and-Bake Cookies (Peppermint Chocolate Slice-and-Bake Cookies), and Coffee Toffee Shortbread (Toffee Pecan Shortbread Cookies). How to Bake Everything by Mark Bittman. Where The Food Lab is all about how to make savory things like steaks and vegetables, How to Bake Everything is all about cookies, cakes, pies, and anything else you’d find at a bakery. 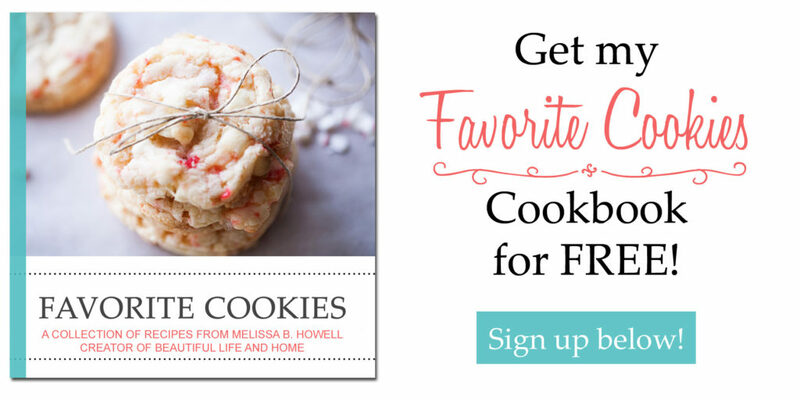 If you want all the tips and tricks to baking like a pro, along with recipes from around the world, then this is the cookbook for you! Kitchen Aid 6 Quart Professional Series Mixer. We never had one of these growing up. I never even used one until college when my freshman roommate introduced me to one. It was amazing! But somehow, I considered it cheating. No way could it be this easy to make chocolate chip cookies. No way the mixer could knead bread for you. But it was easy, and now I can’t imagine living without mine. 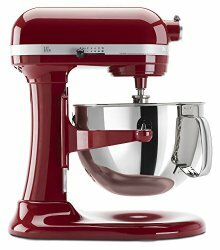 The one I have listed here is bigger (and better, in my opinion) that the traditional Kitchen Aid Mixer. Whereas those mixers have a tilting head that you have to lift up and only come with bowls with up to a 5 quart capacity, this Professional Series mixer comes with a 6 quart capacity bowl that you lift up with a lever. I find this much more convenient than tipping the heavy head back on the traditional mixer. Plus, this mixer literally comes in every color under the sun! There is one that is sure to match your kitchen décor perfectly! Yes, it is a little pricey, but well worth it, since these mixers have a reputation for lasting. 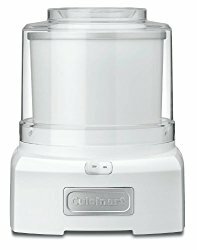 Cuisinart 1.5 Quart Frozen Yogurt-Ice Cream Maker. This is an appliance that is just fun to use. Everybody likes ice cream, and making it yourself gives you a thrill. It’s so much more satisfying than buying ice cream at the store! With this ice cream maker, you don’t need any salt, and your ice cream can be soft-serve consistency in a half an hour or less! The Cuisinart brand is the ONLY brand of ice cream maker I recommend. I tested two other brands of ice cream makers and was sorely disappointed in their unacceptable performance. (You can read my review by clicking here). These have come down in price since I bought mine years ago. If you love ice cream, there is really no reason not to own one of these. 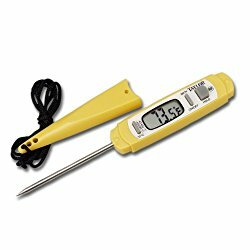 If you don’t have a meat thermometer, this is the first thing you should buy. It will change your life. I am one of those people who are very wary about under-cooked meat—especially chicken. This meant that in the past, I cooked the HECK out of my chicken, and it was always super dry and tough. I thought this was just how chicken was supposed to be, until I got this thermometer. I soon realized that I could take the chicken out of the oven much sooner than previously thought, and that it was tender and juicy, yet still safe to eat. Miu Silicone Baking Mats. These are one of the Seven Wonders of the Baking World. If you have never used silicone baking mats before, you must go get some this very day. They are inexpensive, but will totally revolutionize your cookie baking experience. Never again will you have those undesirable crunchy bottoms caused by metal pans. These baking mats also make it so that you can remove the cookies sooner. Somehow, they cause the bottoms to be more cohesive, and the cookies just slip right off without bending or crumbling. Removing cookies sooner also means you can load up the pans with another batch of dough without waiting so long. All the silicone mats I have tried are great, but I own the set above. Have you ever watched The Great British Baking Show? If so, you may have noticed that they weigh their ingredients instead of measuring them. This is the way most of the world (outside America) cooks. 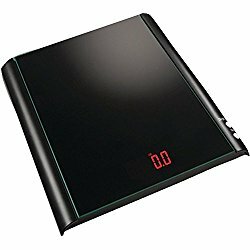 I used to think that a kitchen scale was unnecessary. That’s probably because I was a snob and thought I could just figure things out on my own. But I became converted when I realized that I really had no idea how much 2 ½ pounds of potatoes was. There are also other ingredients measured by weight instead of volume (like chocolate chips), so a kitchen scale is a very handy thing to have indeed. Cooking turkeys is dangerous business. I’m not worried about getting the temperature right (thanks to my handy meat thermometer that I mentioned above) or about the breasts being dry. I’m worried about taking the darn thing out of the oven! If you think back to your high school physics class, you might remember that putting 20 pounds on an outstretched arm with an unstable base and no counter-weight is a recipe for disaster. When you are dealing with a really hot pan, it makes things even more dangerous. Enter the unheralded roaster oven. I love this thing. Just cook the turkey on your counter top and lift it out (while standing up straight rather than precariously leaning over a burning oven) with the included rack when it is done. 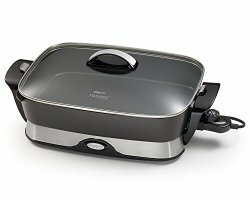 Presto 16-inch Electric Foldaway Skillet. If you don’t have a fryer but want to make French fries or donuts, then an electric skillet is a must. The temperature dial ensures that your oil stays hot like it should so that you don’t get soggy or burned food. A skillet can be used for lots of other things, too, from pancakes to stir fry and more. You can even use it as a buffet server. There are several awesome things I love about this particular model. First of all, you can remove the pan from the base and wash it in the dishwasher! There is also a spout for pouring liquids out of the pan and a spoon and spatula holder. The handles fold down so you can easily store it without taking up extra space. Waring Double Belgian Waffle Maker. This double waffle maker has been a game changer for our family! Every Christmas, we have Belgian Waffles for breakfast. The problem is, it takes so long to make all the waffles! This amazing waffle maker solves that problem because it cooks two full-sized waffles at the same time! It also has a setting for you to control how brown the waffles get. 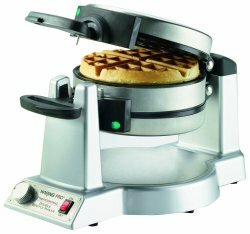 If you make waffles with any regularity, you owe it to yourself to get this waffle maker! When you’re a foodie, you get excited about little innovations in design. This hand mixer is the perfect example. First of all, it has a flat base so that when you need to set it down, you can have it stand upright with the beaters still over the bowl. With all the other hand mixers I have ever used, you have to precariously perch the mixer over the edge of the bowl and hope that it doesn’t fall over, taking the contents of the bowl with it. This mixer also has digital speed control. This prevents you from accidentally turning the speed up too far and splattering yourself with cake batter. Another cool feature is that it lets you rotate the base so that the cord comes out of the side that is best for you, depending on if you are right-handed or left-handed. And the best thing (that I have never seen on any other mixer) is that is has an LED light that shines down into your bowl so you can be sure you got all those lumps out. The quintessential home organizing book that has taken the world by storm! This is my favorite home organizing book, and the “textbook” for my own HOME program–Home Organization Made Easy. I’ve read and referenced this book more times than I can count. It greatly simplifies the task of organizing and cuts out all the decision-making flow charts that other books and programs employ. Some people find the author’s Japanese ways a little quirky, but I find them charming! This book is a must-have if you are trying to get your life in order! The More of Less by Joshua Becker. If you’re not so sure this “minimalism” lifestyle is for you, give this book a read and then decide. Becker explains that minimalism is not about getting rid of everything you own and living like a hermit. It’s about living in the best way possible for you, with exactly the right amount of possessions to sustain the lifestyle you want. He also talks about cultivating a spirit of generosity in yourself and your children as a way to declutter your life and live happily. That’s a philosophy I can get behind! While this book doesn’t have a specific “system” for helping you organize, I think it’s a great companion to the other books I’m recommending here. The Hoarder in You by Dr. Robin Zasio. After I met Cory Chalmers, one of the stars of the t.v. show Hoarders, I became very interesting in the phenomenon of hoarding. I found this book by one of the therapists for the t.v. show and found in fascinating. Learn the psychology behind hoarding (and just plain hanging onto stuff we don’t need, or buying things we don’t need) and get practical advice for getting your clutter under control. It’s Just My Nature by Carol Tuttle. This is the book I reference more than any other. It teaches about the four Energy Types and how to understand and love yourself and others! When I say this book is life-changing, I am not exaggerating. It has completely changed how I view myself and how I interact with others–especially my husband and children. If you read only one self-discovery book, let It’s Just My Nature be it! (This book is also the basis for the Dressing Your Truth program, which I have highlighted extensively on this blog). The Child Whisperer by Carol Tuttle. This is a companion book to It’s Just My Nature and helps you identify the special gifts and natural talents of your children. It explains why each of your children are so different, and gives suggestions for how to best tap into your children’s energy to give them what they need. It also helps you identify what YOU may have needed as a child and guides you in healing some of those past hurts. The Four Tendencies by Gretchen Rubin. (You may know her as the author of The Happiness Project). Another great book using the four-personality model. If you are familiar with the four Energy Types as explained by Carol Tuttle in her books and Dressing Your Truth program, you will find similarities in the four personality types in this book. Are you an Upholder, Obliger, Questioner, or Rebel? I’m an Upholder, which matches perfectly with Type 4 in Carol Tuttle’s Energy Profiling System. I found that The Four Tendencies deepened my understanding of the Energy Types and gave me new insights into my husband and children. If you’ve never heard of Brendon Burchard, get ready! Things are about to change for you! As the most highly-paid motivational speaker who shares the stage with the likes of Tony Robbins, Brendon Burchard has an infectious energy and uplifiting spirit that makes you feel like you can do anything! I love everything he has written and could read it over and over again. He often gives away his books for free (you just have to pay for shipping). Visit brendon.com to find out which books are currently being offered for free. Failing Forward by John C. Maxwell. I love this book so much! When you seem to fail over and over, this book gives much needed encouragement and helps you reframe your “failures” in a more positive way. Since failure is an inevitable part of everyone’s life, best we learn how to use it to our advantange! I’ve read it twice and will probably read it again! Some of the chapter titles are, “Is the Past Holding Your Life Hostage?”, “Grasp the Positive Benefits of Negative Experiences,” and “Make Failure Your Best Friend.” So intriguing! This is a classic book that has stood the test of time. So many of us are caught in patterns of negative thinking without even realizing it. This has a huge effect on our lives, and the lives of those around us. First published in 1952, it’s as relevant now (or even more so) than it ever was. “How to Create Your Own Happiness” and “I Don’t Believe in Defeat” are two favorite chapters. I’ve read this book twice. It’s definitely one you’ll want for your home library. I loved how this book treated obstacles as not just something to overcome, but the very things that lift us up to achieve our dreams! Championing the ancient Greek philosophy of stoicism, this book teaches through inspirational stories and practical application. If you want to turn your problems into your biggest advantages, this is the book to read! The Belly Fat Cure by Jorge Cruise. I’ve tried a lot of health programs. This is the one that has worked the best for me. I like all the scientific explanations about how you get belly fat in the first place, and alternately, how to get rid of it! There are a lot of great low-sugar and low-carb recipes in here. This is my go-to cookbook when I want to make something healthy for dinner! The Healing Code by Alexander Loyd. This book offers a fascinating, scientific look at how our very DNA is influenced by our experiences, and the experiences of our parents and grandparents! It’s been long established in the medical community that stress causes disease. But how do you get rid of it? Is there a way to actually heal yourself of most of your ailments? This book was so eye-opening for me and presented things I had never thought of before. Many of us are suffering from things that didn’t even happen to us, but are written in our very cells! If you are open to non-traditional healing methods (i.e. doing things besides taking pharmaceuticals, although they do certainly have their place), then this book is a must-read for you. The Tapping Solution by Nick Ortner. In recent years, Eastern medicine has become more widely accepted in the West. Acupuncture, once though of as “voodoo medicine,” is now covered by many insurance plans. This book teaches you how to marry the art of acupressure with positive psychology to help heal mental, emotional, and physical ailments. I love that the author of this book and his team have helped kids in the Sandy Hook school shooting recover from their trauma, as well as children in Africa who have suffered in genocides. Everybody Always by Bob Goff. I loved this book so much. The author is so funny and approachable. His stories are inspirational and educational. This book is about how to love everybody, always. Easier said than done, right? There was an insight in this book that completely changed how I view EVERYBODY, and it has brought me so much peace! The stories of his trips to Africa to educate witch doctors seem crazy, but he is actually doing it! I love his audacity. Plus, his office is on Tom Sawyer Island at Disneyland! He’s a total character with an inspiring message. I wish everyone in the world would read this book! Bonds that Make Us Free by C. Terry Warner. Dr. Warner was my philosophy professor at BYU. The rough draft of this book was our primary textbook. It is an understatement to say that it was astounding and transformational. If you want to improve your relationship with anyone, I cannot recommend this book highly enough.